Melbourne has been in love with Mexican and Latin American flavours for years now, and chef Paul Wilson is one of the city’s most prolific purveyors. After an illustrious stint at the famed fine diner The Botanical, Wilson became a consultant chef and go-to guy for all things zingy and zesty, travelling the Americas, writing a book and creating menus for spots such as Acland Street Cantina and the revamped Newmarket Hotel. Wilson’s latest menu can be found in the ever-evolving northern enclave of East Brunswick. Lady Carolina is a loud and lively street food joint outside, and a moody and more refined restaurant, ceviche and cocktail bar inside. Those cocktails are pisco, rum and tequila based of course, while out that back, its tacos, beer, tacos, BBQ corncobs and tacos. Local design studios Biasol and Elena Critchley have produced two distinct fit-outs that set the tone and reflect the dining style of each space. Internal walls stripped to reveal original brickwork, distressed and faded turquoise paint, two-tone parquetry floors and loose vintage timber screens find the sweet spot between rustic and refined. 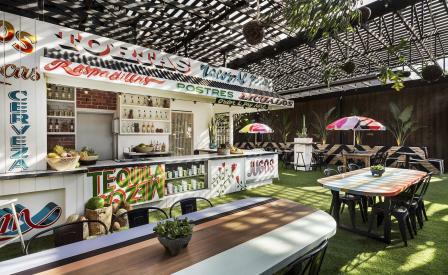 In the large open air courtyard, dappled light, banana palms, loud hand-painted signage and astroturf flooring keep it casual, colourful and, in the current heady depths of a local summer, crowded.